Telenor India, the wholly owned subsidiary of the Telenor Group, has started offering 1GB 4G/2G Data/day for as low as Rs. 100 per month (read 28 days). Telenor has introduced 2 new 1GB 4G/2G data/day plans for its customers in Andhra Pradesh & Telengana circle only. 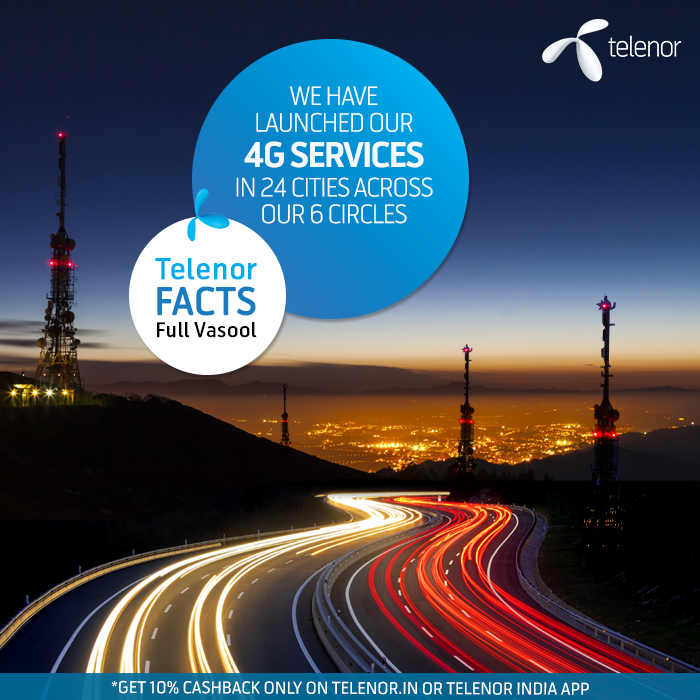 Telenor’s 4G service is available in Vizag, Vijayawada, Eluru, Tenali, Bhimavaram, Warangal, Guntur, Cuddapa, Rajahmundry, Karimnagar and Hyderabad. Telenor offers 12 4G Packs for its customers in Andhra Pradesh & Telengana telecom circle. Starting with the 4G Pack 11, Telenor offers 1 GB 4G data for 1 days and the 4G Pack 47 offers 400 MB 4G Data for 15 days. The 4G Pack 85 offers 500 MB 4G data for 21 days and the 4G Pack 97 offers Unlimited 4G (1GB FUP/ Day) data for 28 days. The 4G Pack 149 offers 2 GB 4G Data for 28 days and the 4G Pack 239 offers 6 GB 4G Data for 28 days. You can recharge the Telenor 4G Packs for Andhra Pradesh & Telengana via MyTelenor App or do Online Recharge on Telenor website or via an Offline Retailer or via USSD as shared above. It is important to note that these plans just offer data which can be used on 2G or 4G and no calling benefits are offered. In case you are looking for Calling Benefits as well, you check out Telenor’s 116 & 146 plans that offer calling benefits and were recently launched.